and Executive Chef Patrick McCabe. Above right: Hotel Director Xavier Mattihas. Right: Executive Chef Patrick McCabe. Above: The atrium in the main dining room. The main dining room has a variety of tables. Above: A large table in the atrium. Below: The dining room has separate rooms. One of these is used for breakfast for guests in the upper levels of Royal Caribbean's loalty program. Above: The most popular item on the menu is lobtster. Below: The staff prepares for the once-a-cruise brunch in the main dining room. "Each venue offers its own unique feel. It is a whole experience. That is what we try and achieve in all of our venues. It is a different experience based upon where you go. And we hope that it is a lasting experience, something that you would remember." Royal Caribbean wants the passengers to look back and say: "I went on the Explorer and there is this restaurant up on top, I think the name is 'Johnny Rockets' and they were doing the YMCA and it was so interactive that we joined in and danced. I went to Portofino and it was the best Italian meal I ever had but it was very intimate, very comfortable, very cozy, the ambiance was great. I went to Café Promenade and I enjoyed the fact that I was able to get my own coffee, get a Danish and get out quickly. And I went to the dining room and I was served a nice gourmet meal. Or I chose not to eat in the main dining room one night and I went up to the Windjammer and I was able to have some very fresh stir-fry I had some pasta cooked for me just the way I wanted it, with the condiments I wanted, the sauces I wanted In addition, they had sushi. So it leaves that imprint on your mind." "The way we look at our clients is this is the only time that they have to have a vacation and they have chosen to spend it with us. As such, it has to be a positive memory, not going away with a bad taste in their mouths. It is our desire to always wow." Executive Chef Patrick McCabe adds: "The dining is an integral part of the success or failure of a cruise. From that aspect, if the dining is not up to par it can really affect the satisfaction of a cruise. There are 134 of us back in the galley and we are all striving to make sure that it is as good as it can be." 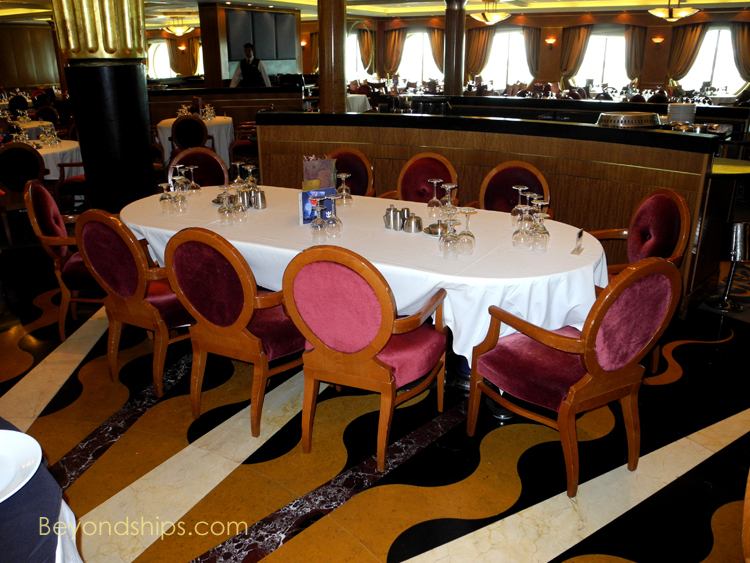 The main dining room on Explorer is a grand room located towards the stern of the ship. Huge pillars soar up through a central atrium to a ceiling with a giant sun sculpture several decks above. Terraces of tables surround the atrium on three sides. Each level of the dining room is so big that it has its own name. It is a spectacular room. "The vision of dining in the dining room - - I think it is old school dining," comments Chef McCabe. For dinner, it offers multi-course meals. One side of the menu offers a selection of appetizers, soups and main courses that remain the same each night of the cruise. These are traditional favorites including steak, salmon, and French onion soup. The other side of the menu changes each night. "We don't necessarily theme dinners like we did in the past," Mr.Matthias notes. "When I began 17 years ago, every night [the waiters] had an outfit based on the nation you were presenting - - the Italian, the Mexican, the Caribbean and so forth. The dishes from those places are still served, like we have Italian night with the scampi; the Caribbean night, we'll do jerked chicken and the pork; and we'll do the French night when we have the coco vin, the escargot and so forth but it is not as highlighted as it was back in the past." While it can vary along with the demographics of the passengers, the most popular item "is the lobster. Everybody craves the lobster," Chef McCabe laughs. His personal favorite, however, is "slow roasted prime rib. I think you can't go past it. And anything to do with chocolate." Both items are on the menu the same night and some guests order both. Along the same lines, if a guest would rather have the side dishes from another main course instead of the side dishes that come with the main course he or she ordered, it can be done. "Mix and match as much as you want. We are not regimented - - [it is not] 'this is what the menu says; this is what I am doing.' You are here to enjoy yourself." Thus if a dish comes with rice, you can replace it with a potato "If that is what you want, that is what you get." Similarly, if any item is not how you want it, tell the waiter. "If it is incorrect, it will be corrected straight away. There will be no questions asked. Whether it is [actually] medium rare or not does not really matter, if the guest wants us to cook it less, we will cook it less. If they want it cooked more, we will cook it more. We want to please. That is the main thing we want to do. We want everyone to leave the dining room happy with food and service." Each level of the dining room has its own galley, which is a beehive of activity throughout the dinner period. "The vast majority of it is [cooked] ala minute. We cook at the meal period for the meal period. There are always going to be a couple of exceptions to the rule, the lamb shanks, for instance, or the prime rib - - something which takes a long time to cook. And it is continuously cooked throughout the dinner period. So we don't cook at 5 o'clock for 6 o'clock service. We have enough for approximately 100 people at a time but we will continue to cook throughout the meal period. There is a ticket system and a meal count system. So as each request is coming in, we are counting it and that information is being relayed to the various stations so they know how much of everything to cook." For dinner, guests have a choice of the traditional cruise ship dining system or of a flexible dining system called "My Time Dining." Under the traditional system, there is an early seating and a late seating. Each guest is assigned to one of those seatings for the duration of the cruise. They also have an assigned table. Usually, the guest gives his or her preference as to the seating and the table size when he or she books the cruise. Those who are dissatisfied with either should see the maitre d'. While the traditional system is more regimented, Chef McCabe points out that it has its advantages. "You get a nice big table, you are forced to have conversation, you are forced to meet people. Okay, the first day, it might be a bit tenuous but after a period of time, you end up making friends for life on cruises. My mother and father came on a cruise a few years ago and they are still in contact with everyone from their table. I think that is one of the positive things with the dining room experience." Under My Time Dining, the guest can come to dinner anytime the dining room is open. "You can go to dine as early as 5:30 and I think we take the last reservations as late as 9:30." Mr. Matthias says. "When it began, a lot of people elected that option because they wanted private tables for two and we are limited in terms of how many tables for two that we have at our disposal. As it has grown and become more well-received by our guests, we have seen that almost anyone takes it up." Indeed, the program has proven so popular that Explorer is expanding its My Time Dining area to an entire level of the dining room. "That deck has the capacity of holding 450 guests. Generally, what we aim for is two and a half turnovers in terms of covers so in actuality we will be able to do 1,200 to 1,300 guests." One level of the main dining room is open for breakfast. "We do a rotating breakfast menu. We do a chocolate breakfast where everything has to do with chocolate on the breakfast menu. That is extremely popular," the Chef notes. Also on the last sea day of a cruise, a grand buffet brunch is held in the main dining room. This event substitutes for the traditional cruise ship gala midnight buffet and late evening chocolate buffets. Mr. Matthias explains: "We have seen [those] to be a waste of food. We did some market research and the guests said 'I enjoy seeing it but I can't eat that late." The brunch "starts at nine and runs until two. It is continually replenished and refilled. There are a lot of things that are made to order." The main dining room is open for lunch on the other sea days. Guests have a choice of ordering off the menu and being served or of taking all or part of their meal from an elaborate salad bar. "When we started out, we had a pasta bar and now they have changed that to a salad bar. That is much better received by our guests because everyone is into healthy living and counting calories. You can design your own salad and specify the quantities you need in terms of the green foliage and so forth. Also what is quite popular in the salad bar is the meats that we have available, the prosciutto etc. A lot of guests will go and just have a main course salad." The Chef and the Hotel Director talk about Explorer's buffet restaurant, its specialty restaurants and its casual dining venue in Part II of this article.